Every business organization has to earn income to sustain in the business. The income is obtained from various sources and mainly differentiated as Capital Receipts and Revenue Receipts. Both these receipts play the major role in the working of the business organization. 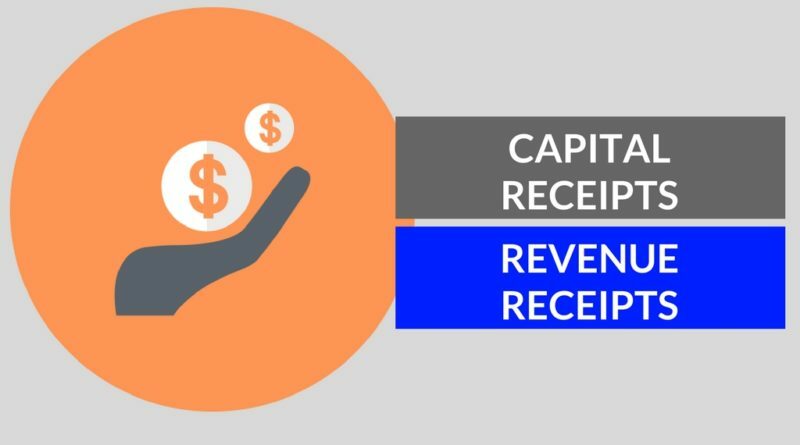 The previous article is focused on Difference between Capital Expenditure and Revenue Expenditure and this article focuses on Capital Receipts and Revenue Receipts of the business organization. Capital Receipts can be easily defined as an income generated by the capital assets of the organization. it is an income obtained by the organization through the sale of fixed assets, additional loans obtained from banks, the additional issue of public capital, insurance claims, etc. Capital Receipts are non-recurring income of the company which comes from investment and financing activities of the management of the company. Machinery sold for = Rs55,000. Revenue Receipts can be easily defined as an income generated by the day to day business activities. it is an income obtained by the sales of goods, the commission received, discounts received, dividend received on shares, interest received on shares, etc. Revenue Receipts are recurring in nature i.e. the income from day to day business operations occurs every month regularly. Goods Sold for = Rs 25,000. Capital Receipts are the income obtained from the capital assets of the organization. Revenue Receipts are the income gained by the daily operational activities of the business. Capital Receipts are non-recurring in nature because it occurs only one time for an asset in a year. Revenue Receipts are recurring in nature because it occurs every month more or less. Capital Receipts are shown in the balance sheet and affect the balance sheet by either appearing on the credit side or by the reduction in the value of some asset. Revenue Receipts are shown on the credit side of the profit and loss account of the company. Capital Receipts are the ones which either decreases or increases the value of an asset of the company. Revenue receipts are the one which affects the profitability of the company like day to day incomes. Capital Receipts are received in exchange of sources of income such as capital goods or assets of the organization. Revenue Receipts are received in substitution of an income of the company. The person responsible for the recording of transactions should have good accounting knowledge to differentiate the receipts into capital receipts and revenue receipts if misrepresented the financial statements of the business does not represent the fair view of the business.